The events industry is just as susceptible to the ebb and flow of trends as any other, and with so many events calling for a strong aesthetic and clear visual identify, ensuring your design choices are on-trend will go a long way towards helping you pull off a successful, visually compelling event. 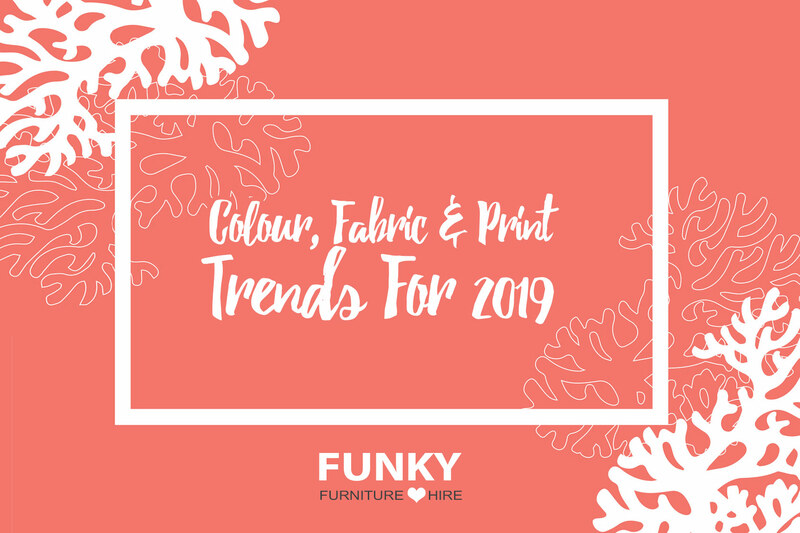 There's no need to be a slave to trends of course, and we're all for individuality, but even the most individual of events will benefit from a nod to what's currently hot, so below we've picked out 6 of our favourite trends in colour, fabric and print for 2019. Beautifully soft and sumptuous velvet has exploded in popularity over the last few months, in fact in February 2019, Livingetc.com reported a massive 400% increase in search volume for the word "velvet". Sofas and armchairs made out of velvet are a great way to include this coveted fabric at your event, as are velvet cushions, which are a great way to accessorize your look. Living Coral has been named as the 2019 colour of the year by the colour experts Pantone. It's a soft yet energising colour with golden hues that's extremely adaptable and well suited to soft furnishings, and perfect for use as an accent colour at events. If not-quite-orange, not-quite-pink coral doesn't take your fancy, hot on its heels is hunter green. Green always brings a fresh feel to any space, but the slightly darker hue of hunter green results in a classy, more timeless look. "Combine on-trend dark green with equally on-trend velvet and you've got yourself a truly winning look." Combine on-trend dark green with equally on-trend velvet and you've got yourself a truly winning look. For inspiration take a look at our Cosmo green velvet sofa, or check out our full range of green furniture and accessories. According to Elle Decor, florals are big news this year. From big and bold abstract blossoms to full on chintz, floral patterns are where it's at. We've recently added some beautiful floral cushions to our range of accessories which provide a great way to explore this trend at your next event. Metallic colours were big news last year, but this year it's all about mixing it up. Rose gold, bronze, silver, anything goes, so have fun with your interiors and be bold by mixing and matching metallics. Take a look at our Malibu range of coffee tables, benches and console tables which are available with silver, gold or rose gold frames, or why not take a look at our full range of gold furniture and accessories. It's clear from the 2019 Pantone colour of the year that this year is all about creating optimism with bright colour palettes are everywhere. As well as living coral another popular colour for this year is yellow, with Google Trends revealing a clear upsurge in searches for terms such as "yellow sofa". Yellow is a great vibrant colour that can bring a feel of both calmness and energy to a space, no mean feat in a single colour! Take a look at our yellow fabric Swan style chair or our bright yellow Eames style Eiffel chair which, as well as being jolly comfortable, they both provide a great way to bring a splash of yellow into your event space.